Norman Horrocks passed away yesterday, October 14, 2010. He was a scholar and gentleman. He was a recipient of the Order of Canada. He was a professor, teacher, librarian, publisher, and all-round good guy. I’m not going to list off everything that Dr Horrocks has done in his life since you can find those details elsewhere. 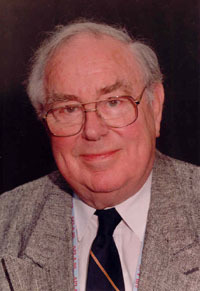 There are some important things we should recall, such as his work with the LA/CILIP, the ALA, and the CLA; his war service for Britain; his unsurpassed knowledge of government documents collections and organization in several jurisdictions, and his work with the School of Information Management at Dalhousie University. It’s this work with SIM that matters most to me and to so many others today. What matters is the way this man has affected so many people’s lives. This afternoon, after a reference meeting at Dal’s Killam Library, word got out amoung my fellow librarians that Dr Horrocks had passed on. I looked around the office, and as the most recent hire (and as Dr Horrocks’ last student amoung my colleagues), I realized that nearly everyone I worked with had themselves either worked with or been taught by Dr Horrocks. And as for the few people in the office who had not had the occasion to shake this man’s hand, they surely have been touched by his work with so many of our professional associations and standing committees. We all have our favourite moments to remember Norman Horrocks by. For me, it was a chance encounter at the 2009 CLA Conference in Montreal. I attended on a scholarship but had to remit my expenses after the fact, so I chose to stay at an inn which was not a conference hotel in order to save a few dollars. On the second day of the conference, I bumped into Dr Horrocks and we exchanged pleasantries. How was the weather, how I was enjoying my first CLA conference, etc. He then he asked me how I was enjoying my stay at this hotel. I told him I liked it very much and that I had a really decent sleep the night before. That’s when I realized I hadn’t yet told anyone where I was staying. I called Dr Horrocks on this and asked him how he found out which hotel I booked with. He smiled and winked his eye at me, and then he walked away, quietly chuckling at my expense. To this day, I still don’t know how he found out where I was staying that weekend. But that’s Dr Horrocks for you and that’s how he rolls. It was a quiet, rainy, Friday afternoon today in Halifax. The city is silent and grey, but it’s not completely on account of the weather. Godspeed, Dr Horrocks. I saw some one on Twitter (@podeas) write, "If you don't stand up for the library, who will? – #horrocks". That line is incredible. It's a stern reminder that what we do is more than "just a job" and that we shouldn't forget that. Ever. I saw some one on Twitter (@podeas) write, “If you don’t stand up for the library, who will? – #horrocks”. That line is incredible. It’s a stern reminder that what we do is more than “just a job” and that we shouldn’t forget that. Ever.